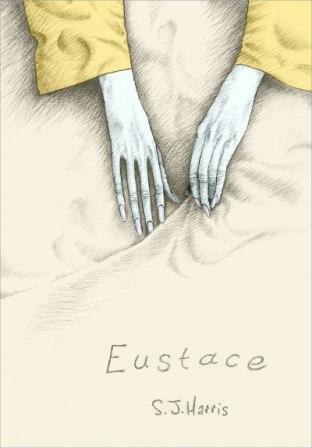 Eustace is new this year, and it’s astonishingly good. Like Shakespeare’s Measure for Measure, it’s a work of two halves, although with Eustace I’m afraid both halves are tragic: there’s no happy ending here, in spite of the dramatic turn of events when Uncle Lucien (‘Lucy’) shows up almost exactly half-way through. The first half of the book is really quite remarkable. 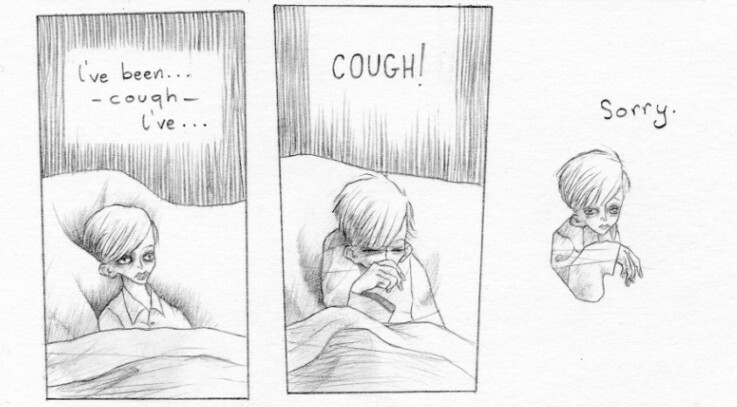 Our narrator is Eustace, a terminally ill eight-year-old boy who is confined to his bed. On the face of it, there’s not much scope for narrativity given that Eustace is so ill he can barely move and his room is bare and unfurnished; however, Eustace manages to be an entertaining narrator nevertheless. We learn about his parents’ appalling neglect, his mother’s unhealthy fixation on Frank, her eldest son, Eustace’s dread of physical contact with his aunties, the ghastliness of his boisterous cousins, his ineffectual uncles, and the unsavoury doctor, who, despite all evidence to the contrary, believes Eustace to be a time-wasting malingerer. Eustace addresses the reader directly and it becomes clear in the second half of the book that these theatrical ‘asides’ are, in fact, clearly audible to the others present, and Eustace’s guests can’t understand why the boy is chattering away to himself all the time. The reader is cast in the role of ‘invisible stranger’ rather than ‘invisible friend’ (Eustace won’t allow invisible friends in the house anymore), and we are at first rather taken aback to learn that Eustace’s words are overheard by the characters. This is one of the ways in which Harris goes about breaking the fourth wall, as it were. There’s another example of this sort of thing on page 21 when Eustace tells us that Frank is in the army, but the image of Frank changes in the following frame when Eustace realises that the uniform Frank is wearing as he stands next to the bed is probably outdated. The story constantly draws attention to itself, and we are repeatedly reminded that none of this is real. Free and imaginative use is made of space and frames: for example, parts of the picture fade or disappear, often leaving Eustace stranded and floating in white space. The pictures fade to blankness when Eustace asks the reader to leave so he can use the chamber pot. The effect of all this is twofold: first, the reader is given a role in the story and is actually addressed as a presence in the room, and second, one is led to ask just how much of what we see is actually just a figment of Eustace’s imagination. A small boy confined to bed has to find some way of passing the time, after all. There is a scene in which the aunties actually start devouring Eustace’s cousins, all of which is clearly in the small boy’s mind: he imagines on page 38 that when his aunties tell him he has a label sticking out, they are in reality pulling at his clothes in order to shove a bayleaf down his back before running to the kitchen to switch the oven on. And there’s something in the artwork I don’t think I’ve ever seen before – a smaller frame taking up a fraction of the larger frame to suggest not just movement, but a passing moment. 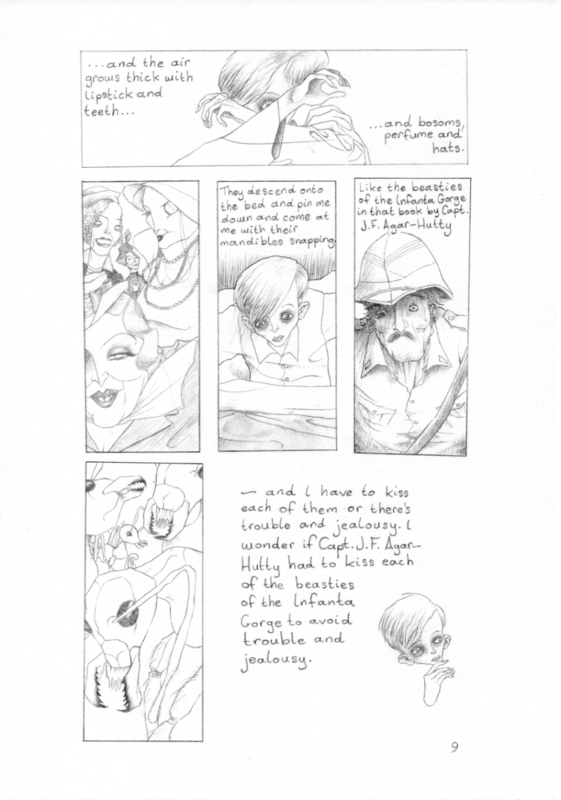 On page 143, Eustace begins to address his father, but gives it up as a bad job, and the reader sees in one panel both Eustace’s abortive attempt to get his father’s attention and his angry, despairing expression a second or two later. It’s very effective, and in this instance, very moving. Eustace’s days are enlivened by the visits of his aunties, one of whom has a splendid left hook and manages to give Eustace a lovely shiner with a blow meant for one of the other aunties. Aunty Nin’s catty remark (‘in that hat, which you wear so relentlessly, my dear, you remind me of one of the four horsemen of the apocalypse – and his horse’) is what sparks the row, and Nin’s retaliatory left hook goes wide of the mark and knocks poor Eustace out. A steak is brought for his eye, and in the pages following, the reader travels with Eustace through his nightmare landscape of the unconscious. Pages 102-105 are the most beautiful and the most disturbing in the whole book. Eustace, still in his pyjamas, wanders through a bleak landscape until he comes across a horribly wounded man tied to a tree with barbed wire. The man has no legs and his blood flows freely. The man is posed as a Christ figure, or perhaps St Sebastian, but he is identified as Frank when men in uniform rumble past in their tanks shouting ‘Three cheers for Frank!’ The family resemblance between Eustace and Frank is so strong that Eustace could almost be looking at himself in the figure tied to the tree. He drives away two crows who are eating what’s left of Frank’s legs and sobs, ‘Oh Frank, what have they done to you?’ and Frank responds with ‘Eustace? That you, old thing?’ Eustace attempts to caress Frank’s poor face, but as he does so, Frank’s mouth melts and in the following frames, his entire body liquefies. Eustace wakes up with a start to find a bloody steak on his face. Disturbing though this is, the second half of the book demands a stronger stomach still. Uncle Lucy is wanted by the police for crimes of fraud and embezzlement and is ‘lying doggo’ until he can find a way out of London. Uncle Lucy sets up camp in Eustace’s room, and is soon joined by a succession of criminals, whores, pimps and many other characters from London’s underworld. In fact, Eustace’s bedroom becomes The Place To Be, but there is a catch: Uncle Lucy won’t allow anyone to leave in case the police are alerted to his whereabouts. Now everyone is a prisoner in Eustace’s room, and this includes the reader, being, as we are, one of Eustace’s inventions. Eustace was imprisoned before by his illness, but now he is under threat of physical violence if he makes any attempt to leave. All this is very odd and the reader is left wondering whether any of it can be real, but, unreliable narrator though he is, even Eustace couldn’t make this up: an eight-year-old boy as sheltered as Eustace could not possibly be able to imagine the goings-on of the second half of the book. In fact, he quite clearly doesn’t understand what he sees. 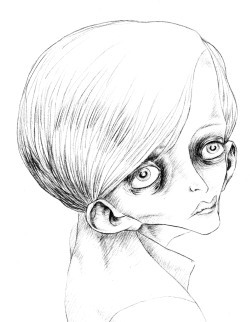 The reader knows a great deal more than the child-narrator and reads events very differently: we know what Frank and Peter are doing under the bed, and what Uncle Lucy and Oubliette are doing in the wardrobe, but Eustace doesn’t. We read the pictures differently and Eustace is no longer in control, as he was when he re-imagined Frank’s uniform. The book ends with a newspaper report detailing how the events of the book play themselves out, but this tongue-in-cheek report is obviously not designed to fool the reader into believing that anything narrated here actually took place. Nevertheless, it adds yet another inscrutable layer to this surreal tale. I can’t recommend it highly enough…but be warned: the second half in particular is graphic in every sense.